Most of the time, medicines are not pleasant to the taste not only to humans but to animals as well particularly horses. For this reason, it might be difficult to give the exact dose you want to an animal as big as a horse. However, with formulation such as in paste form, you can treat any conditions conveniently. For an effective horse ulcer treatment, you need a formulation that can be conveniently administered and that is AbGard. AbGard contains equine Omeprazole to be used as horse ulcer treatment. It is, no doubt, an effective medication which helps suppress the production of acid in the stomach. Ulcers are formed from the constant production of gastric acid which is not neutralized by saliva from frequent feeding. Usually, horses may be seen as frequent feeders that constantly have something inside their mouths for most part of the day. Once these horses are stabled, their diet changes and they may not eat as frequently as before. Acid production is simply a natural process that continues on with or without food to digest. If there is nothing to digest, then this acid becomes injurious to the stomach lining, and thus ulcers are formed. 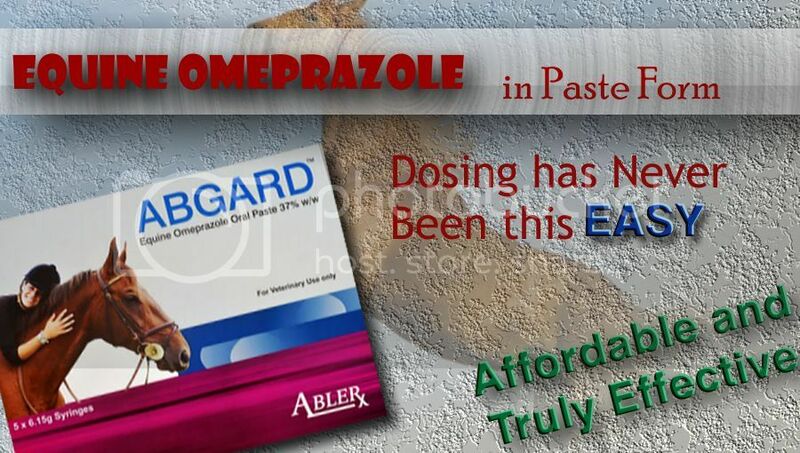 Equine Omeprazole is also the active ingredient of Abler’s AbPrazole but AbGard comes in this paste form which may be a good alternative to the AbPrazole granules. At times, when horses are off their feed, Omeprazole paste may be an excellent substitute. Here are some tips on how to properly administer your AbGard Omeprazole paste. How to administer your AbGard Omeprazole paste. – Before giving the dose, make sure your horse’s mouth is empty and without any traces of feed. – Next is to remove the cover from the syringe. – After which, you shall insert the device into the horse’s mouth. – Press down the syringe plunger until you can’t press anymore. This means the knurled ring has stopped the plunger indicating that the dose has been delivered. For this reason, you need to have the correct weight of the horse because dosing in the syringe is based on the weight. AbGard is a name you can trust when it comes to treatment of horse digestive ulcers. When it comes to the overall health of your horses, you only need the best medication there is. Respond to ulcers immediately and find the most effective, most convenient and affordable equine Omeprazole to help you – AbGard.